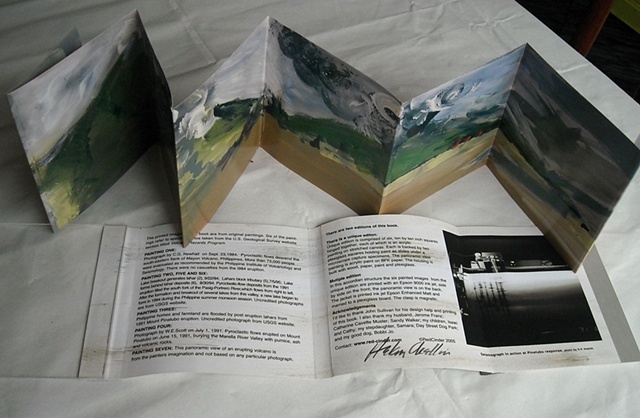 Signed artist book, by Helen Chellin. Multiple editions. In this accordion structure the six painted images from the unique edition are inkjet printed with an Epson 9000, side by side in the front; the panoramic view is on the back. The jacket is printed on Epson Enhanced Matt and married to a plexiglass board. The clasp is magnetic. The jacket is printed on Epson Enhanced Matt and married to a plexiglass board. The clasp is magnetic. In this accordion structure the six painted images from the unique edition are printed with an Epson 9000 ink jet, side by side on the front; the panoramic view is on the back. Images from the unique edition are printed as six single images, side by side, on the front and the panoramic view on the back. The jacket is printed ink jet on BFK paper and married to plexiglass boards. The clasp is magnetic.